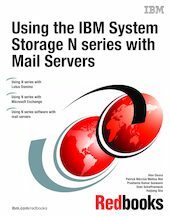 This IBM Redbooks publication gives mail database administrators a introduction to the IBM System Storage N series. It also gives both storage administrators and mail database administrators the information to prepare, install, and administer the IBM System Storage N series when used in conjunction with Microsoft Exchange and IBM Lotus Domino. Often the lines of responsibility with regards to these tasks are blurred or crossed over, so some sections of this book may be redundant for experienced N series administrators but of importance to mail database administrators. Conversely, some sections that may be redundant for mail database administrators may help storage administrators.